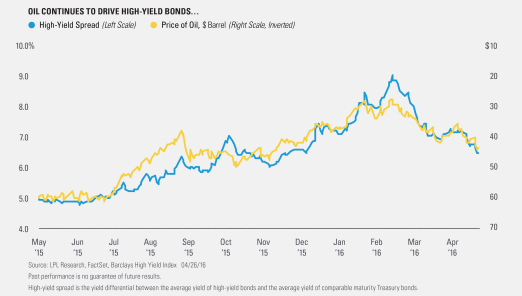 Oil and high-yield bond prices remain tightly linked. A close relationship between the two has persisted since summer 2014, when the price of oil began to decline from over $100 per barrel, and the linkage remains as strong as ever (per the figure below). In fact, for the five trading days ending April 27, 2016, the correlation between the average yield advantage of high-yield bonds (or spread) to Treasuries and the price of oil has been -0.96, a near perfect inverse correlation. Higher oil prices reduce default risk for energy issuers, which comprise a significant 13% of the Barclays High Yield Index, and also lower spillover risk to the broader economy. Oil’s impact on the economy is also reflected in a close, but inconsistent, relationship to Treasury yields (see figure). Resurgent oil prices help explain a seven-day losing streak for Treasuries (April 18–26, 2016), and the correlation has been relatively high (0.67) since the start of 2016 through April 26. It would be comforting to say that the impressive 10%+ rebound in high-yield bonds from February 11, 2016 through April 26, 2016 was due to a refocus on broad market fundamentals, but the tight correlation says otherwise. It’s still very much all about oil. 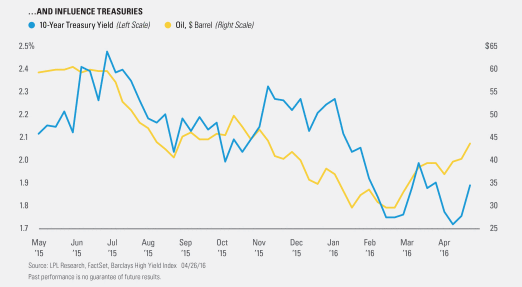 This is less true for the broad bond market, but oil prices continue to have a heavy influence in 2016. Corporate bonds are considered higher risk than government bonds but normally offer a higher yield and are subject to market, interest rate, and credit risk as well as additional risks based on the quality of issuer coupon rate, price, yield, maturity, and redemption features. The Barclays U.S. Corporate High Yield Index measures the market of USD-denominated, noninvestment-grade, fixed-rate, taxable corporate bonds. Securities are classified as high yield if the middle rating of Moody’s, Fitch, and S&P is Ba1/BB+/BB+ or below, excluding emerging market debt.